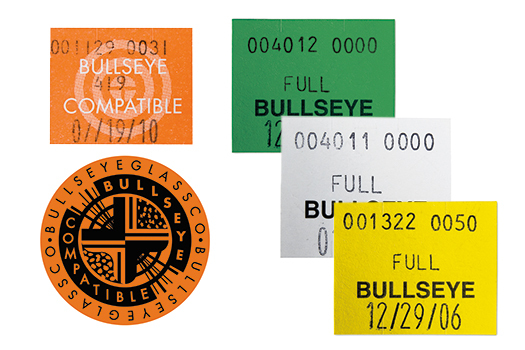 “Fusible” glasses pass factory testing for color and fusing compatibility. They carry the “Bullseye Compatible” label and are recommended for kilnwork and flamework, as well as cold applications. “Standard” glasses pass factory testing for color, but are not designed for fusing. They are recommended for cold applications such as stained glass, mosaic, copper foil, and leaded work. We also offer two grades of Curious-quality glass: Fusible-Curious and Curious. Fusible-Curious glass is graded "B". Its color or appearance fall outside of our target range, but it is still recommended for kilnwork, flamework, stained glass or mosaic. Non-fusible Curious is graded "C". It falls outside our accepted color or appearance range and is not recommended for kilnwork but is still good for stained glass or mosaic use. To learn more about our coding/grading system, please read our glass coding PDF. Also, be sure to read our notes on "What to Expect from Bullseye Glass".